As the job market improves, job options for workers are increasing and so is employee turnover. According to the Bureau of Labor Statistics, the average tenure of the American worker is 4.6 years. For a Millennial worker born between 1977 and 1992, the wanderlust comes even sooner. Millennials move on an average of every 3.2 years. Employee turnover is a trend that shows no sign of stopping, making it increasingly important for employers to offer competitive pay and benefits to their staff. For those that do jump ship, it’s critical for employers to ensure they’re taking the correct steps manage employee departures. Changing jobs is a lengthy process for both employees and employers, which is why it’s crucial for companies to have a formal process in place. Whether employees leave involuntarily or of their own volition, HR managers should carefully follow exit procedures with employee departures. There are five steps you should consider when you and your employees split ways. As an employer, the benefit to exit interviews for you is hearing a realistic take on what workers think about your company, management and the host of other items that come with a job. Since departing employees are more likely to be open and honest about any problems they might have with the organization, you can take their feedback and apply it as necessary moving forward. Use exit interviews to gather important information about whether salaries and benefits are up to par with competitors, as well as to improve culture, processes, management and development programs. Most states have a timeline for when employers need to issue final paychecks to departing employees. Violating these regulations could lead to fines, penalties and interest payments. Make sure you’re aware of the law in your state. FindLaw is a website for small business owners with a list of final paycheck requirements by state. Each state has its own law regarding what has to be included in final paychecks. While you may be aware of requirements for hours worked and potential severance pay, make sure you know your state’s policy about compensating for unused sick or vacation time. When an employee covered under a company’s health plan leaves to take another job, he or she is protected by the Health Insurance Portability and Accountability Act. If new group health insurance coverage is available, either at the worker’s new job or through his or her spouse’s employer-sponsored plan, the departing worker must request enrollment in the new plan within 30 days. To ensure that pre-existing conditions are covered under the new plan, the worker’s former employer is required to provide a certificate documenting previous continuous coverage. Workers who are laid off, quit or retire from companies with 20 or more employees, and who participated in their employers’ group health plans, may qualify to continue coverage under the Consolidated Omnibus Budget Reconciliation Act (COBRA). Employers must provide these departing workers with written notice explaining their rights under COBRA, and the workers have 60 days from the date of notice or the date coverage ended, whichever comes later, to sign up for COBRA coverage. COBRA coverage remains in effect for 18 months, or longer in some cases. Some employers offer workers the opportunity to enroll in voluntary health care benefits in addition to major medical insurance plans. These voluntary benefits vary from company to company and may include disability insurance, long-term care insurance, accident and hospitalization insurance, cancer or specified-disease insurance and more. When meeting with exiting workers, employers should discuss their enrollment in these plans. In some cases, coverage terminates when employment ends. In other cases, coverage may be portable and remain in place as long as the worker continues to pay the policy premiums. Although you might offer all of your employees some type of retirement benefits, everyone will need different information upon departure. A Millennial will need different details than say, a Boomer, who is a few years away from retirement. You should provide departing workers with copies of their retirement plan summary descriptions, as well as individual benefit statements. Explain if, when and how benefits can be collected, either at retirement age or in a lump-sum payment, as well as whether benefits can be rolled over to an IRA or to a new employers’ plan. According to the 2013 Aflac WorkForces Report, 48 percent of workers are likely to look for a new job in the next 12 months. While retention should remain a top priority for all employers, businesses should always have a plan in place for professionally handling employee departures and prepare to discuss these topics with them. It is in the best interests of both your company and your workers to avoid loose ends and ensure that everyone is on the same page. The post Best Practices for Managing Employee Departures appeared first on Small Business Trends. The new MacBook Pro with Retina display may not be the computer for every small business. But those needing high end features in the areas Apple excels, like graphics, should be ecstatic. The latest generation of the laptops announced recently offered some pleasant surprises. Most importantly, Apple has dropped the price of the new laptops from $2,199 to $1,999 for the 15-inch laptop and from $1,499 to $1,299 for the 13-inch computer. Better processors (an Intel Core i7 for the 15-inch and a Core i5 for the 13 inch laptop). Improved Intel Iris graphics in both laptops. Increased battery life up to nine hours in the 13-inch and eight hours in the 15-inch. Apple introduced Retina display models of both the MacBook Pro 13-inch and 15-inch laptops last year. For those in need of a refresher, basically, Apple defines Retina display as one in which the number of pixels is so great the human eye can no longer distinguish them individually. So the number of pixels varies with the size of the display. For the new MacBook Pro, Apple says that amounts to more than four million pixels for the 13-inch laptop and more than five million for the 15-inch producing images crisper than the printed page. The post New MacBook Pros Feature Price Cuts But Improved Features appeared first on Small Business Trends. 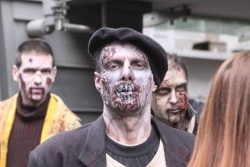 Sofia citizens are going out on Thursday night to celebrate Halloween, despite the fact that it is not a traditional Bulgarian holiday, rather an imported one that became quite popular in the country in recent years. Halloween fans will have a large selection of events on Halloween night as it would be difficult to find a club in Sofia, which will not mark the special day. Halloween is based on the ancient Celtic holiday ‘All Hallows Eve’, that marked the only day of the year when dead spirits were allowed to walk the earth. Most celebrated in the US, Halloween has now spread its influence mainly as a commercialized event in many countries that did not celebrate it five or ten years ago, Bulgaria included. You are currently browsing the Business, finances, forex blog archives for October, 2013.